On Saturday, June 17th, 21 members of IBEW Local Union 26 participated in the 7th Community Service Project at the Stoddert Terrace Housing Complex located at 155 Ridge Road, S.E., Washington, D.C. What started out years ago as a way to give back to the community has grown into a solid partnership with the District of Columbia Housing Department (DCHD). This partnership, spear-headed by the Local 26 Minority Coalition (LU26MC) leadership has yielded over 668 pro bono hours for DCHD. 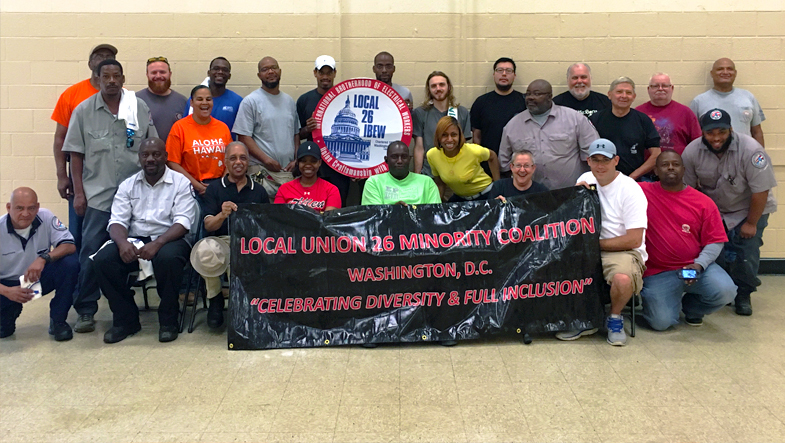 Overall it is a great humanitarian effort that benefits all parties – DC gets donated labor, the residents get updated lighting, light switches and receptacles and Local 26 gives back, improving the community where its members live and work. The volunteers were joined by Elissa Silverman, at-large member of the District of Columbia City Council. Not only did Councilmember Silverman talk with volunteers, but she actually tried her hand at installing a light switch. A heart felt thank you to the Councilmember for taking time from her schedule to come out to join and encourage us. Also, a special thank you to the Retired Members Club, Motorcycle Club and the members of Local 26. The LU26MC is already planning its next community service event in partnership with the DCHD and will be recruiting volunteers soon.